Being the mother of the bride can be a little stressful. The next most important outfit, after the brides of course, is the mother of the brides outfit. At Girl Meets Dress we understand that being the mother of the bride places you in the spotlight, so we have carfully selected our favourite mother of the bride dresses to hire to ensure you look fabulous on your daughters big day. 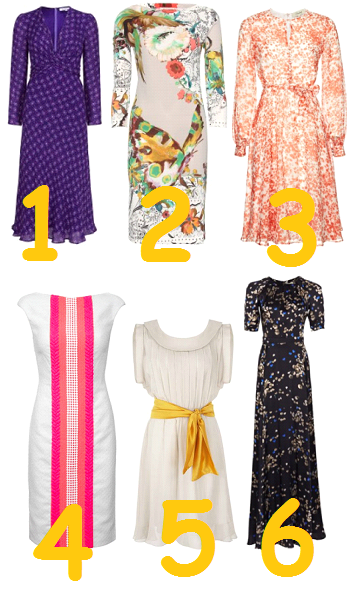 Here are our top mother of the bride picks to hire staright from GMD HQ. This polka dot blue Libelula gown is feminine and pretty and would make the perfect dress for a summer wedding. This dress will get you noticed, the bright and fresh design adds a fun touch to the classic cut of the dress. This Beulah gown was created for weddings with its scattering of soft pink blossoms, layered skirt and key hole neckline it would be the perfect outfit for a summer wedding. This Erica dress is an elegant mix of a classic cut with a modern twist, the classic white dress and fuchia stripes complement each other and create the perfect ensumble for a wedding. This dress is simple and chic with a bright golden sash being the focus of the dress it is an elegant and fun option to hire . This long gown is pretty with its simple cut and cinched in waist adding a feminine touch, its flecks of brown and blue hues create a lovey neutral tone to the dress. Posted June 5th, 2014 in Features. Tagged: Dress Hire, Girl Meets Dress, mother of the bride dresses, mother of the bride london, mother of the bride outfits, rent dress, top picks, wedding fair, wedding outfits, wedding season.